The glittering line-up promised at the 2019 Vertical World Circuit launch in Seoul outshone expectations with the first two men summiting under record time. 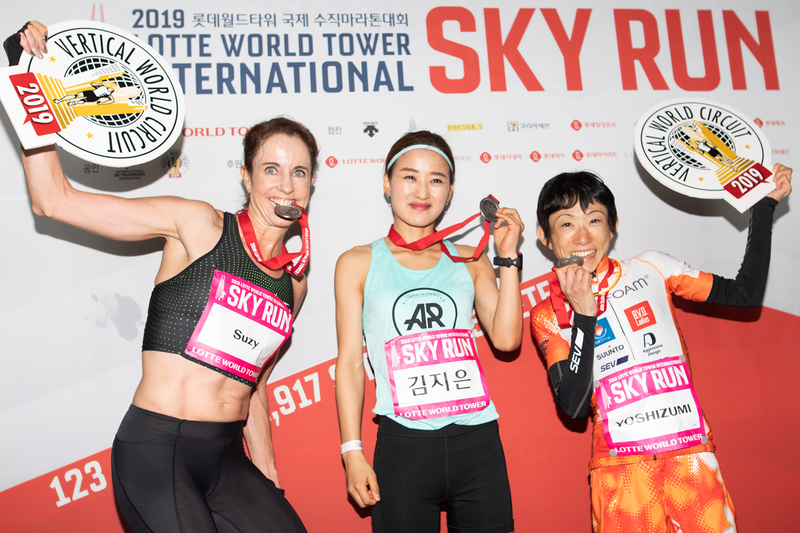 The third edition of the Lotte World Tower International Sky Run saw a record 1,600 competitors take part today in the fifth tallest building in the world and the highest race on the circuit. 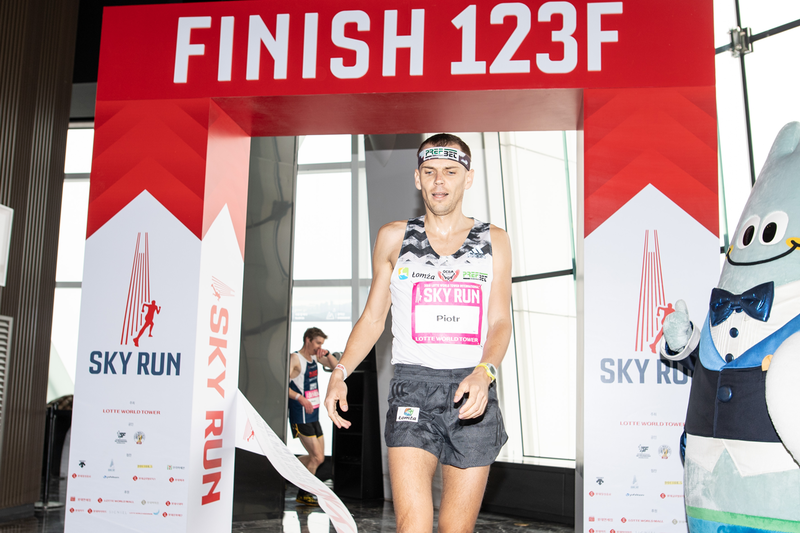 Star of the show was last year’s winner, Poland’s Piotr Lobodzinski, five-time VWC champion, setting a new record in 15’37” to ascend 2,917 steps, 123 floors and 500 metres vertical climb. It was always going to be a battle between the winner and Australian Mark Bourne, holder of the first record, 15’44”, set in 2017. Bourne closed two seconds off Lobodzinski in 15’39”. Third man was Japan’s Ryoji Watanabe in 16’27”, repeating his 2018 third place. The women’s field saw a new face on the top of the podium, Korean Ji Eun Kim, who beat the world’s number one stair climber, Australian Suzy Walsham in 19’05” on home ground. Walsham was not on top form with calf issues and was unable to stay below her own sub 19’ forecast. She closed in 19’20” leaving her 2018 record of 18’45” intact. Third lady was Yuri Yoshizumi from Japan in 19’29”, three-time winner and record holder of the Harukas Sky Run, Osaka, the Vertical World Circuit semi-final. 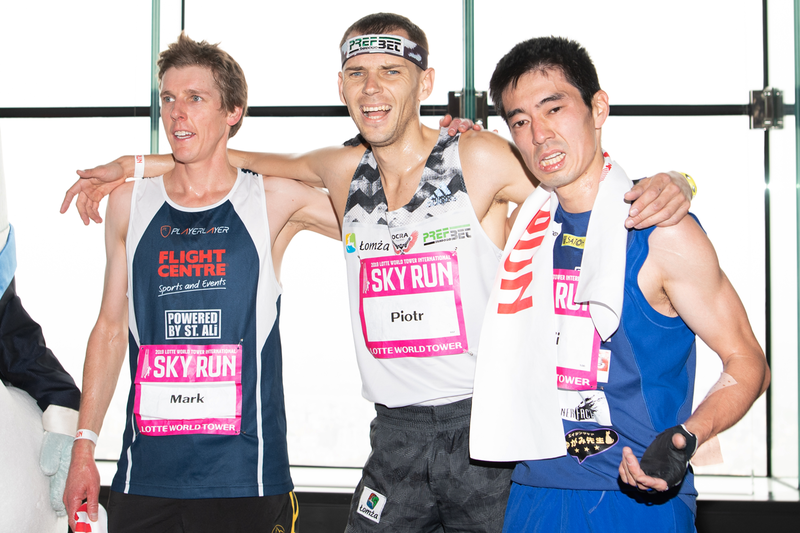 Celebrating ten years since the launch, the 2019 Vertical World Circuit counts eleven races, the highest number to date, stretch across the globe from New York to London, Paris and Milan in Europe, via Dubai in the Middle East and on to Asia, hub of the world’s tallest towers in Seoul, Ho Chi Minh City, Beijing, Shanghai, Osaka, concluding with the Grand Finale in Hong Kong. With just enough time to catch their breath, the world’s top stair climbers will head to Milan, Italy, for the second stop on the Vertical World Circuit on April 14, with the Allianz Vertical Run where Lobodzinski will again be challenged by Bourne and Walsham will head the women’s race in a top class élite field from 16 countries.